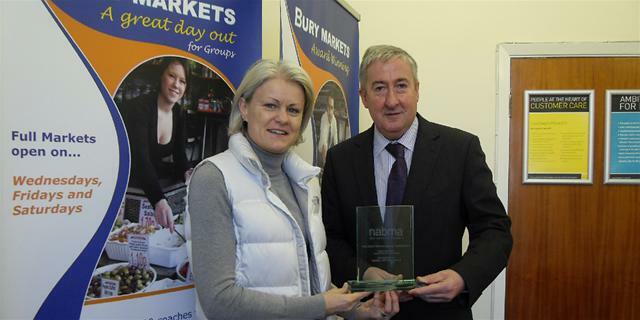 Bury Market received another national accolade yesterday when it was again crowned 'Market Attraction of the Year' at the National Association of British Market Authorities (NABMA) Great British Market Awards. The awards were presented by Sean Wilson, former star of Coronation Street and now an award-winning cheese producer and chef. Graham Wilson OBE, NABMA's chief executive, commented in his summary at the Awards' Ceremony: "Bury Market continues to set the bar for other markets to follow." Andrew Heyes, Bury Markets manager, said: "This competition was a chance to give Bury Market an even greater national profile, and show why this major North West visitor destination is successful. It's down to many things including team work, positive publicity, innovation, reinvestment and most importantly giving the customers what they want and a willingness to welcome change." Councillor Sandra Walmsley, cabinet member for resource and regulation, said: "We are all immensely proud of Bury Market, which continues to be a huge attraction for people across the region and far beyond. This latest award is fully deserved." Bury Market has won a huge number of awards, including NABMA's Market of the Year in 2006 and Market Attraction of the Year in 2009 and 2012.